Annmarie Kelleher is a Clinical Rehab Specialist in the Wheelchair Seating and Power Mobility outpatient clinic at the VA Pittsburgh Healthcare System. She is a licensed Occupational Therapist with 17+ years of hands-on clinical and research experience in the field of assistive technology (AT). 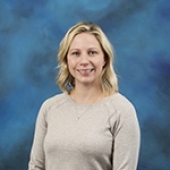 Mrs. Kelleher received her BS and MS in Occupational Therapy from the University of Pittsburgh in 2001 and 2004, respectively. She has been a RESNA certified Assistive Technology Professional (ATP) since 2004. In prior roles, Mrs. Kelleher provided direct clinical AT services to individuals with diverse mobility-related disabilities at the UPMC Center for Assistive Technology. She is also the former Assistant Director for Clinical and Regulatory Affairs at the Human Engineering Research Laboratories. In 2010, Mrs. Kelleher became a certified Clinical Research Coordinator (CCRC) by the Association of Clinical Research Professionals (ACRP). Most recently, she completed a Healthcare Compliance graduate certification program through the University of Pittsburgh’s School of Law. With extensive experience in the provision of AT and regulatory compliance, she is committed to helping people with disabilities to live life to the fullest through advancements in clinical care and research.